Actually, it’s not the rays emitted from your TV that kill you, it’s the negative content. So, if the majority of your viewing triggers fear, anger, hate or worry, you are wearing down your health and shortening your life. Research shows that even one five-minute episode of anger is so stressful that it can impair your immune system for more than six hours. And, it’s not just the negative content you view on TV that’s bad for your health, it’s the daily length of of time you spend devoted to viewing. 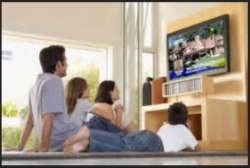 Ask yourself, does viewing the evening news add more value to your life … or less? Years ago we stopped watching the evening news (and TV all together), and we’re convinced it was a good decision. We’re not missing anything of value …as far as we know. We love to watch entertainment that inspires, uplifts, informs or is just plain funny, so we carefully select DVDs of movies or TV shows that meet our requirements. We watch about 2 hours per night …that’s it. We don’t use our TV for anything else. This leaves us much more time for personal interactions with friends, family, and each other … another important aspect of a total wellness lifestyle. It just might be a good idea to look at the time and way TV impacts your life today. Believe it or not, it could be a life saver.